Reliance Communication (RCom) has launched a new Data Pack offering 1GB data per day for its customers across India. The Data Pack is an Yearly Data Pack offering 1GB data/day for 365 days. Priced at Rs. 365 across all circles, the Yearly Data Pack offers 365 GB data with FUP of 1GB data daily. The Validity of the Data Pack however differs from circle to circle and ranges from 365 days to 382 days. You can check the exact validity in your circle on this page. Also the Data Pack offers just 2G data and it cannot be used for 3G/4G data. If you get good 2G reception, this is definitely a good offer for people who do not high speed bandwidth and would best for people who just need data for WhatsApp, Facebooking etc. There is no Activation Code for this pack and you can Online Recharge this pack on Reliance Website or Reliance InstaCare App. 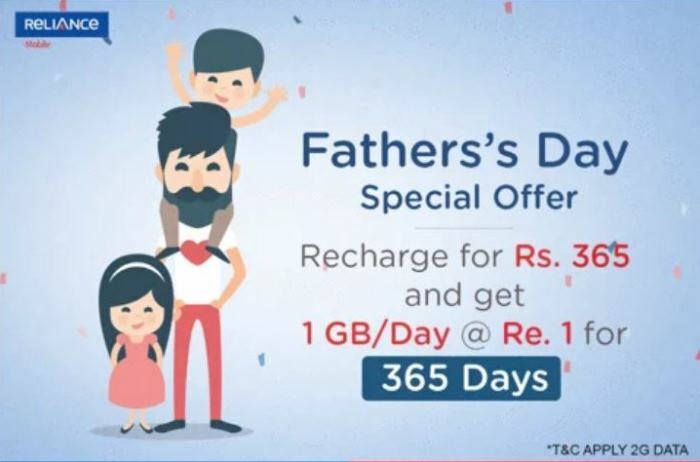 It is available in Punjab and you can recharge this plan online, visit https://myservices.relianceada.com/captureInstantRecharge.do, Enter you number, Email ID and enter 365 in amount. leave the GST field as blank. Then you will be redirected to a new page, there select GPRS/DATA and there you will find 365 Plan. In case you need more help, do let us know.